During intermission last week at an incredible performance of “Once,” in the sparkling DPAC, I couldn’t help but think back forty years to the genesis of downtown Durham, North Carolina’s revitalization. It wasn’t launched by deal makers or politicians or “heavy hitters” or development advocates, a few of whom over the years - including recently - have always seemed somewhat ambivalent about that neighborhood’s distinct sense of place. By ambivalent I guess I include those in every community who appear so fearful of losing a project that they seem determined to surrender sense of place for the generic. Others just seem impatient and dismissive or prone to ridicule preservationist sentiment when it suggests further reflection. Unfortunately, this undermines far too many public facilities too whenever they get fast-tracked within the bureaucracies until it is too late to mesh them with overall sense of place. 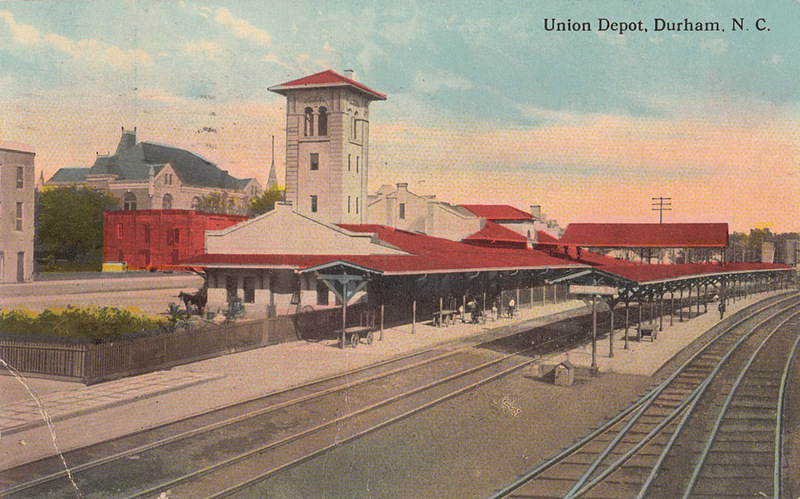 This tension between sense of place advocates and those prone to the generic is apparent in the first studies of downtown Durham which were facilitated in the late 1950s on behalf of the then Downtown Development Association, a non-profit and the public Durham Redevelopment Commission. One dealt with economic and demographic trends and the other, known as the Tarrant Report, with layout and transportation. They were triggered by development of Durham’s first shopping center just less than a mile from city center at a gateway to the historic Forest Hills neighborhood. In a panic, beginning in the 1960s, much of downtown was demolished as a well-conceived national urban renewal movement became more like an indiscriminate battering ram, seemingly unconcerned for sense of place, when in the hands of more narrow special interests at local levels. This was never more true than in Durham where iconic structures perfectly suited for what we call “adaptive reuse” today were demolished including the 1905 Union Station and the historic 1924 Washington Duke Hotel. Swaths of structures and landmarks similar to those that are such a priceless draw for Durham today were destroyed to make room for parking lots and parking decks and a loop or noose around what we call the City Center District. The sense-of-place carnage continued for fifteen years leaving deal makers and enablers sated, but downtown still in decline. Finally, in the mid 1970s, they placed their sights on demolition of the 1926 Carolina Theater (Durham Auditorium,) the last remaining of Durham’s original thirteen theaters in downtown alone. The Carolina had good bones, much better than buildings have today. In fact, it had been the first to bring Broadway to Durham, original casts too. But years of neglect by local officials had taken its toll. So it faced the wrecking ball, just as its famous Durham architect too lay dying. Defiantly, Durham residents and sense of place activists revolted, rose up, and began to reclaim what was left of their downtown’s distinctiveness. It is upon their shoulders that downtown revitalization finally took hold. They formed what is now called Preservation Durham. They saved the Carolina Theater, and in the process spurred Durham’s first commercial historic inventory the basis for a unique national historic district designation. This quickly spurred place-sensitive developers in 1980 to restore the iconic Kress building followed by the adaptive reuse of two tobacco warehouses into Brightleaf Square in 1981, along with conversion of other historic warehouses into condominiums in 1982. However, demolitionists and dealmakers never entirely gave up nor did their fear abate of losing projects because they were out of character. Monuments to this include an incongruous office tower and the shoehorning of a convention center into a parcel only one-third the size needed. But by the time I arrived in 1989 to help jumpstart the community’s overall guardian for sense of place including downtown, the tide had already turned. Our mission included fueling the marketplace and tax base by leveraging place-based assets into demand-driven, visitor-centric economic and cultural development. A few months earlier, voters had approved bonds to overhaul the Carolina Theater which reopened that year giving Durham, once again, a dozen performance halls. Durham had also conducted a community wide, first blush historic inventory that was invaluable. By 1990, upper story lofts were being developed in historic buildings above restaurants on Main Street and quickly inhabited by artists and RTP executives. By 1991, Morgan Imports had begun adaptive reuse of a huge 1926 brick laundry building with unique architectural details that planners for a suburban shopping mall emulated in 1996. In the mid-1990s an energetic successor to the 1950s Downtown Development Association was organized to see the revitalization through to its climax and beyond. Planning by then had already begun on adaptive reuse of tobacco warehouses into apartments which opened around 1999 as the first phase of West Village. Nearby, about that time, Measurement Inc. also began adapting a series of historic factory buildings into office space. These all set the stage for adaptive reuse of the old Lucky Strike factory or American Tobacco as it is known today by the name of a now defunct parent company. The massive project, the largest of its kind in the Carolinas, was obviously already germinating in the mind of the owner of the Durham Bulls by 1996 when he asked his general manager to have me join him along with his corporate counsel in his seats along the third base line. He wanted to discuss who owned the old factory complex towering behind the ballpark’s first base line and its potential for redevelopment. By 2000, it seemed clear that the revitalization of downtown Durham was seemingly irreversible. The sense of place revolutionaries in the late 1970s had ignited a transformation. The following year, American Tobacco began undergoing redevelopment, opening in 2004. Many involved go no further back when referring to revitalization of downtown, probably because this impeccably executed transformation required significant public investment, both direct and indirect. It continues to evolve each day and is without a doubt a testament to the economic importance of retaining the aspect sense of place related to the built environment. You would think that American Tobacco alone would have put to rest for good any incongruity from newer buildings but it hasn’t. At least four public facilities erected since then stand out as anomalies to Durham’s sense of place and several private projects pushed through since then also fail to meet that test. Maybe the tension between sense of place and “generica” is impossible to fully reconcile. For many, the thrill of the deal and/or fear of the unknown if they push back on a project to ensure a good fit will always trump the more temporal value of sense of place. The world needs transaction deal-makers and Durham has had among the very best. But maybe communities are best served by those who are secure enough to say no to a deal and who listen carefully to sense of place experts when it comes to preserving this priceless attribute. What an interesting article! I read it with much interest as a person who grew up in a city (Chicago) that loves architecture so much that one of the daily newspapers has an "architecture" section. I wonder if you'd like to be a guest on Radio Skywriter (on WNCU/90.7fm) or TV Skywriter (on YouTube and Google+). Both are offshoots of the Durham Skywriter. Feel free to call me at 919-809-9682 or write to durhamskywriter [at] yahoo [dot] com.